The shrill sound of a whistle breaks the silence. In one quick, decisive movement Rct. Michael Bridges thrusts his bayonet through his imaginary opponent. Bridges, from Platoon 1025, Delta Company, 2nd Recruit Training Battalion, was just one of more than 150 recruits taking the next step in earning their Marine Corps Martial Arts belt. After more than 27 hours of MCMAP training, recruits are ready to put the skills they’ve learned to the test to receive their belt. He said the techniques taught from the belt syllabus set recruits up for success once they go to the operational forces. “We want to give them the confidence to progress in belts, so they don’t settle on staying a belt,” said Delgadillo, of Los Angeles. During their MCMAP training, recruits are drilled repetitively on the movements the Martial Arts Instructors teach. He said MCMAP does more than prepare Marines for close-combat. 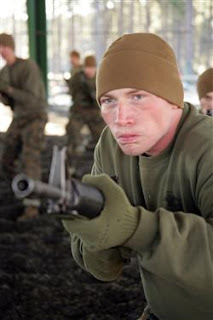 Along with learning defensive techniques, MCMAP teaches mental, physical and character disciplines. “Mental and character discipline teaches recruits and Marines when it’s an appropriate time to use MCMAP,” he said. He said physical discipline focuses on strength and endurance. After recruits complete the test for their tan belt, they have learned the basic techniques to defend themselves. “The bayonet techniques and the counter to chokes and holds are probably the most important movements they learn here,” said Staff Sgt. Peter Ramos, the senior drill instructor for Plt. 10026, Delta Co., 2nd RTBn. “If they run out of Ammo in combat, they’ll know how to utilize their weapon in a close-combat situation,” said Ramos, of Patterson, N.J. The tan belt classes also teach recruits movements such as arm manipulations and chokes, which they practice on each other. “I like working with a partner because using the moves on them teaches me how to control my opponent,” said Bridges, of Clayton, N.C. 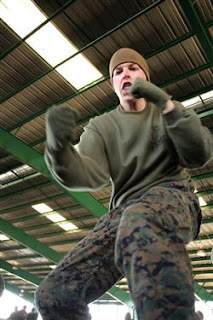 He said that before coming through recruit training, he knew very little about martial arts. Hello, a debt of gratitude is in order for every one of the guests, I will transfer numerous more video clasps in coming days, administrator Oh! Wow its in certainty an amusing and move YouTube video posted at this spot. a debt of gratitude is in order for sharing it. dumpster rental annandale Galaxy Transfer is based in Northern Virginia and is a division of EnviroSolutions, Inc. GT was purchased by EnviroSolutions, Inc. in June 2013.